With spring training games now underway in Arizona and Florida, Major League Baseball is stepping up its campagin to sign up subscribers to its live-game streaming service for the 2014 season. 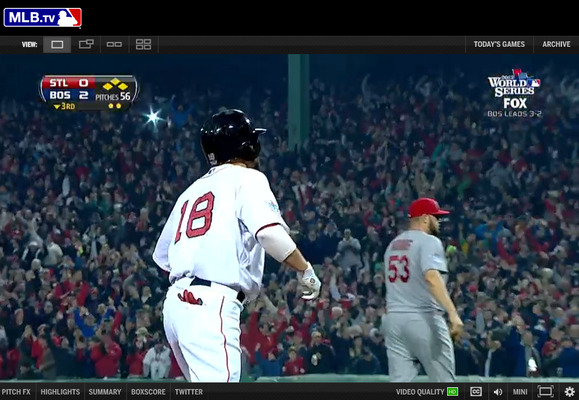 On Thursday, MLB dangled the biggest carrot of all to would-be MLB.TV subscribers—live access to World Series games. Baseball’s season extends well into October for a few lucky teams, but that hasn’t been the case for MLB.TV subscribers since the live game-streaming service launched in 2002. That changes this fall: if you have an MLB.TV subscription, you’ll be able to watch any World Series game via MLB’s At Bat mobile app or on more than 400 connected devices. Baseball’s All-Star Game will be available to MLB.TV subscribers as well. MLB.TV subscribers will still have to contend with some blackout restrictions, chiefly the rule that prevents any game involving your local team from being available through MLB.TV. In my case, for example, that means games involving either the Oakland Athletics or their lesser cross-bay counterparts [You mean the one with two World Series championships this decade? —Ed.] can’t be streamed, whether home or away. Considering that the Los Angeles Dodgers recently signed an $8.35 billion, 25-year deal for exclusive local broadcast rights in their home market, the local blackouts might be with us for a long time to come. Still, Thursday’s moves are a step in the right direction for baseball fans who want to watch any baseball games they can. An MLB.TV Premium subscription costs $130 and includes a free version of the MLB.com At.Bat app for mobile streaming of live radio and TV broadcasts. The $110 subscription lacks the portability features, restricting you to streaming from a computer, gaming console, or other connected device. Games are already available through the service: MLB.TV is carrying 200 live spring training games between now and the start of the 2014 season. This article was updated on February 28 with more information about postseason blockout rules.